The Hop On Hop Off Bus Amsterdam takes you off the beaten track to the city’s hidden gems. 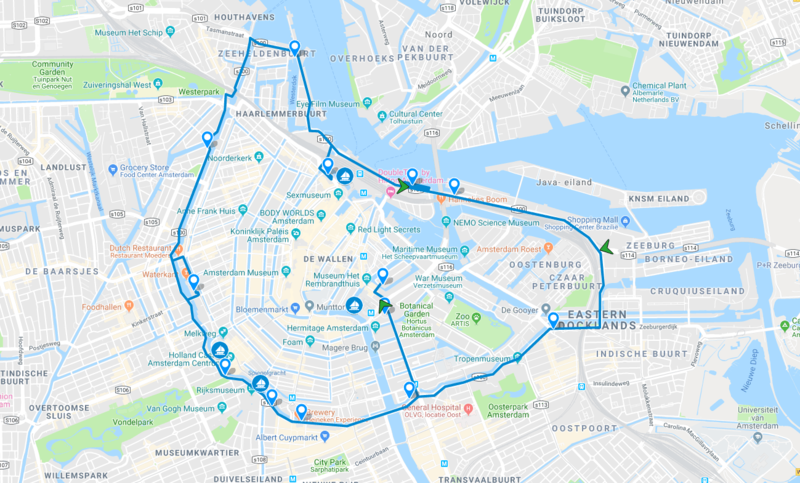 Take a bus tour through Amsterdam on the Hop On – Hop Off Buses from Stromma. Hop on the bus and explore new and exciting neighbourhoods of Amsterdam. With your Hop On – Hop Off Bus ticket, you can hop on and off at any of the stops, whenever you like! This way you can customize your Amsterdam sightseeing trip all the way. Discover urban parks, city markets and some of Amsterdam’s prettiest strolling streets. Hop On – Hop off Buses offer a comfortable way to see neighborhoods most visitors don’t even know exist. Sit back and take in the views while listening to the most interesting stories through your personal audio guide. The audioguide is available in 19 languages. Do you need more hours to explore Amsterdam? Click here to book the Hop On Hop Off 48 hours ticket. On the image below you can see the route the Hop On Hop Off Bus will take.